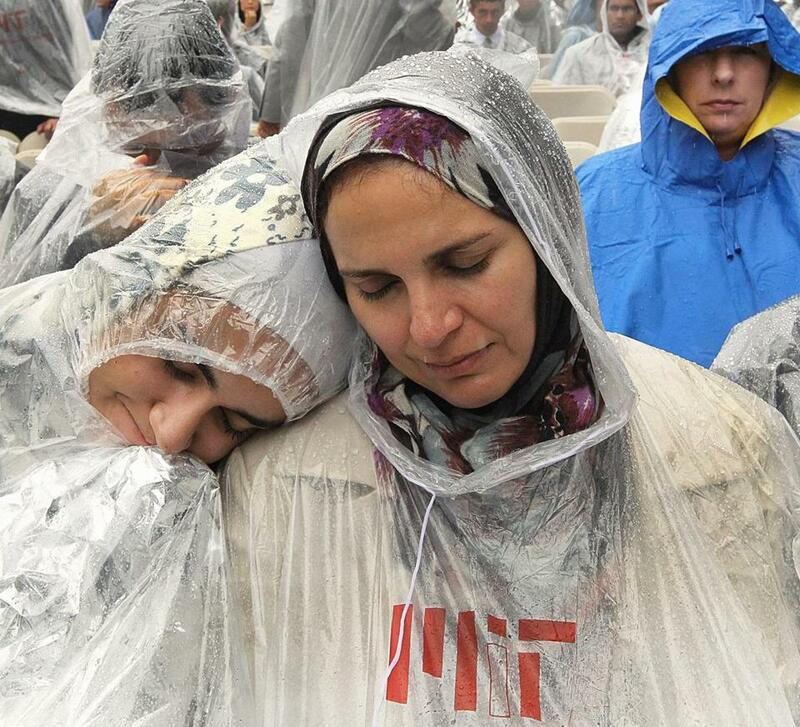 Tala Aryan and her daughter, Laila, waited for her son, Omid, to accept his MIT diploma. Following a year marked by tragedy, speakers at MIT’s commencement ceremony Friday reflected on community members they had lost, while capturing the spirit of the graduating class. The somber tone started with the invocation by chaplain Robert Randolph, who recalled the numerous deaths this year at the Massachusetts Institute of Technology, including the death of a visiting scientist in a bicycle accident, the death of a graduate student, and the loss of MIT Officer Sean Collier, allegedly killed in a confrontation with the two Marathon bombing suspects. In his speech to the class, L. Rafael Reif, president, also spoke of the bombings, and recounted letters he received from strangers who had fled the explosions to find shelter in MIT fraternities and sororities. They wanted to say thank you to the students who had opened their doors in those frantic hours. Friday’s rain poured down onto the crowd of thousands, many of whom were sporting ponchos handed out by the school. Security was tight. Guests were not permitted to bring items such as wrapped presents and bottles, and all bags and coats were searched. In his speech, Reif also urged the class of 2013 to expand MIT’s reputation beyond its outstanding academics. Drew Houston, a founder and chief executive of Dropbox, a free online storage space, told the graduates to find a line of work that they are obsessed with. Houston said that Bill Gates’s first company made software for traffic lights. And Steve Jobs’s first company made plastic whistles that enabled the user to make free phone calls. As the ceremony came to a close, graduates and their loved ones congregated in nearby campus buildings, swapping stories and showing off their newly conferred diplomas. A long line snaked down the corridor of the Rogers Building, as graduates waited to pose in front of the MIT seal. While in line, Ashin Modak, 23, who received his master’s in mechanical engineering, said listening to Houston made him realize how much more there is to do.